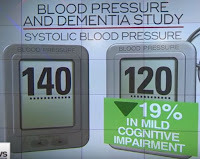 In a new study, treating blood pressure more aggressively lowered odds of developing mild cognitive impairment, a gateway to dementia. CBS News chief medical correspondent Dr. Jon LaPook explains. CHICAGO — The first randomized clinical trial to demonstrate that intensive blood pressure treatment reduces new cases of mild cognitive impairment (MCI), and the combined risk of MCI plus all-cause dementia, was the highlight of new research results reported at the Alzheimer’s Association International Conference (AAIC) 2018 in Chicago. MCI is often nicknamed "PRE-DEMENTIA". If the risk for MCI is lowered, it implies that the risk for dementia is lowered. The preliminary results of the SPRINT MIND trial, presented at AAIC 2018, provide the strongest evidence to date about reducing risk of MCI and dementia through the treatment of high blood pressure, which is one of the leading causes of cardiovascular disease worldwide. At AAIC 2018, researchers reported preliminary results related to risk of dementia and cognitive decline from the Systolic Blood Pressure Intervention Trial (SPRINT). SPRINT is a randomized clinical trial that compares two strategies for managing high blood pressure (hypertension) in older adults: an intensive strategy with a systolic blood pressure goal of less than 120 mm Hg versus a standard care strategy targeting a systolic blood pressure goal of less than 140 mm Hg. SPRINT Memory and Cognition IN Decreased Hypertension (SPRINT MIND) examined whether treating for the lower blood pressure target reduces the risk of developing dementia and/or MCI. Study participants were 9,361 hypertensive older adults with increased cardiovascular risk but without diagnosed diabetes, dementia or stroke. Participant mean age was 67.9 years (35.6 percent women) and 8,626 completed at least one follow-up cognitive assessment. In SPRINT MIND, the researchers found a statistically significant 19 percent lower rate of new cases of MCI in the intensive blood pressure treatment group. The combined outcome of MCI plus probable all-cause dementia was 15 percent lower in the intensive versus standard treatment group. “This study shows more conclusively than ever before that there are things you can do — especially regarding cardiovascular disease risk factors — to reduce your risk of MCI and dementia,” said Carrillo. Check out the NIH's Mind Your Risks® health campaign to increase awareness of the link between vascular disease and brain health. AAIC is the premier annual forum for presentation and discussion of the latest Alzheimer's and dementia research. Bringing the world closer to breakthroughs in dementia science, AAIC 2018 convened more than 5,100 leading experts and researchers from around the world and featured more than 2,500 scientific presentations. How does lowering blood pressure affect patients with ALZ? ?